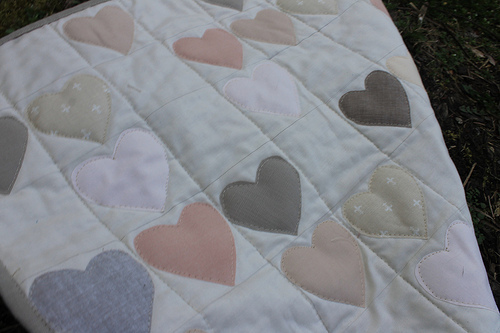 If you are making a wedding signature quilt – here are some of my thoughts on that! Step 1: Pick a font! Then make your monogram in a word processing document (or use this one). You can use any program, of course. I generally use Cambria, which is a nice common serif font. 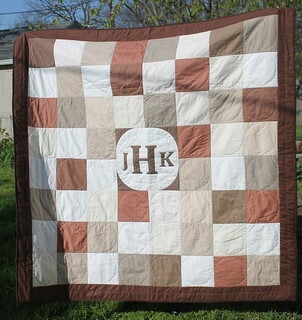 You can also find fun swirly fonts that wouldn’t be that hard to applique. 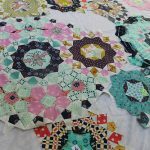 I personally prefer simple clean lines – they look good and are a lot easier to sew and cut out! You generally want your middle initial about twice the size as your other letters; in my example, I have a 500 font middle initial and a 250 font for the others – and I bold them. But you can futz about with it till you get it how you like it. I do the letters as Wordart so that I can nudge them around and reverse them, etc. I’m sure all the graphic designers are rolling their eyes so hard they might get stuck – but it works for me! If you want to flip your letters around backwards, here is a tutorial that will let you do that. I do the smaller side letters as a different text box. Here is an example text document that I made that you can pop in your own letters. Step 2: Pick the size of your block and letters. In this case, my block is 16×16 inches. Cut it out and I also starch my fabric using my home made starch. I want my letters to be 12.5 inches wide. 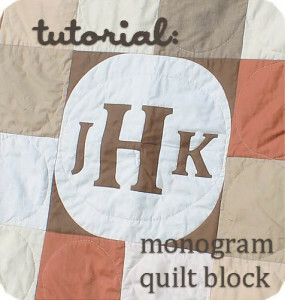 If you like you can print out samples of your monogram to see how it fits onto your block. 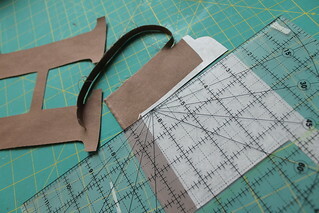 Cut your fusible webbing to the appropriate size. A note about fusible webbing – with Pellon Wonder Under, there is a paper backing, and a light filmy plastic webbing that acts like glue when melted – it holds your fabric in place and keeps the edges from fraying. Leave the paper on for now! 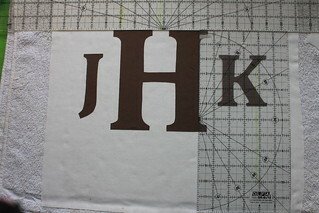 Step 3: Trace your letters BACKWARDS onto the paper backing of the fusible web. I do this by just tracing the letters right off the screen — I zoom in until the letters are the size I need and trace away using a permanent marker. It’s easier in a dark room. 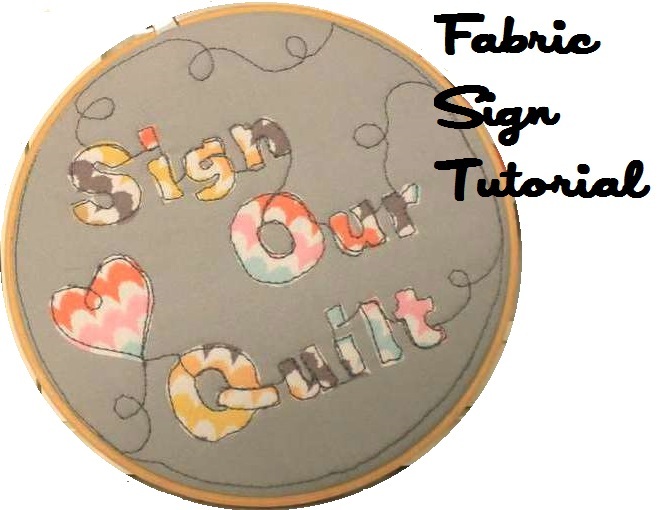 You could also print off your letters and trace onto the fusible webbing using a lightbox or window. (A side note: if you don’t want to reverse your letters, you can trace them directly onto the webbing material). Step 4: Iron your fusible webbing onto your fabric and cut out. See how the letters are backwards on the paper here? That is what you want! I sometimes use a rotary cutter to cut out the long straight edges. 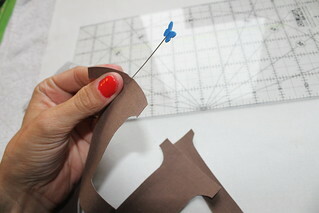 Once your letters are cut out, pick off the paper backing – it’s much easier if you use a pin to start the peel. Step 5: Lay out your letters and center them. I use two rulers! 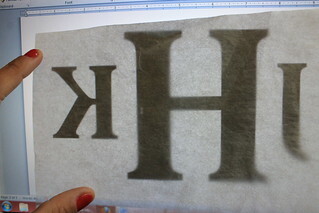 In my example, the long straight edges letters are 1.5 inches apart and 1.75 inches from the top and bottom of the H. You can use temporary fabric pencil/marker to mark your measurements. When you get ‘em where you want ‘em, Iron ‘em down. Press down carefully; don’t move from side to side, as you don’t want to stretch or crumple the letters. Step 6: Sew them down. 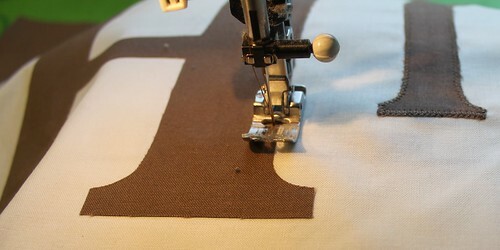 Use any stitch you like – I prefer a zig zag stitch – to sew around the letters to secure them. They will fall off in the wash if you don’t secure them with sewing. 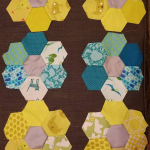 I have done a lot of fused applique and tested it in the wash, and I have not noticed a big difference in fraying if you just use a straight stitch, buttonhole stitch, etc. So your stitch choice is really just a matter of personal taste. 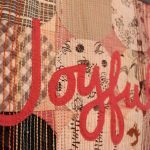 I recommend you try out a few stitch widths and lengths on a scrap piece of fabric to know which looks best on your letters. Step 7: Iron it again. 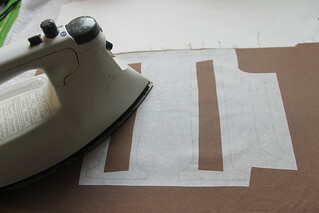 I prefer to iron from the back so I don’t flatten my sewing. Admire it. Doesn’t it look great! 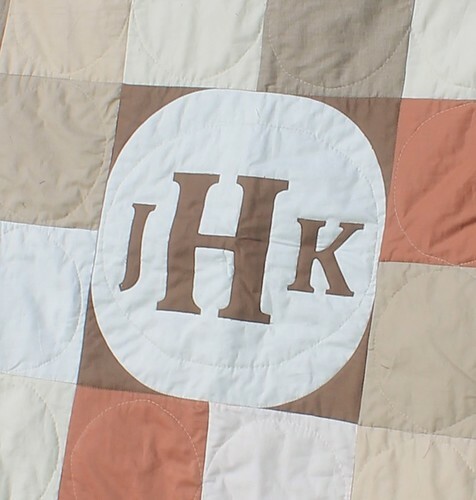 If I’m sewing the monogram into a quilt, I free motion applique using matching thread around the edge of the letters to quilt them down. The stitches aren’t really noticeable, but it looks so much nicer, in my opinion. 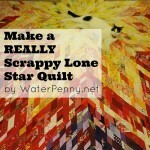 Sew it into a quilt? Make a pillow? Frame it? Awesome tutorial! 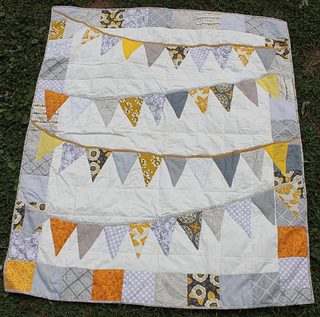 And I really like the simple (but still bold and very eye-catching) quilt! Thanks! I’ll certainly use this tute! I love that you added helpful info such as the font size and finished width of your letters! I find that that causes me the most trial and error headache.